Who doesn't enjoy trying new plants? I certainly do because occasionally, I stumble across something special. An example of this happened recently when I decided to buy some Red Azolla (Azolla pinnata). This is a fern that floats on water. I obtained it online, along with some Algerian winter & water irises that had been my main interest. The water fern was an added after thought, but it was the irises that were put aside once it all arrived. The appearance of azolla alone is fascinating. The effect of this tiny fern covering still water is rather like a verdant fractal. It is miniature perfection in both the structure & attractive green hue in its foliage. But left in the sun, this azolla would turn red & earn its common name. Straight away, it gave me ideas about partial shade & mixing reds & greens. This Red or Ferny azolla is a native Australian, but good news is that there are six more species worldwide. You can grow it too & soon you may want to because it is a super plant. This title is awarded for its ability to colonise fresh water & double its biomass every few days. This ability stems from a symbiotic relationship azolla has with a blue-green algae species, Anabaena azollae. 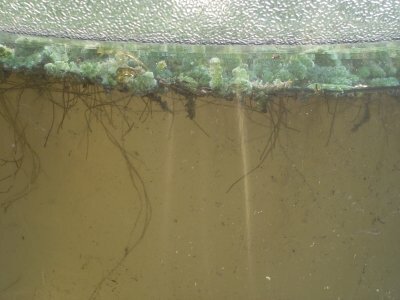 The algae fixes atmospheric nitrogen, allowing azolla to spread places where many other water plants are unable to take hold. In this way, azolla is an ecological trail blazer which will clean water, adding nitrogen to the system & allow other species to help establish healthy regimes. 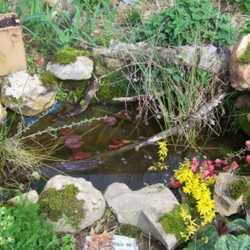 Azolla is also known as Mosquito or Duckweed Fern. 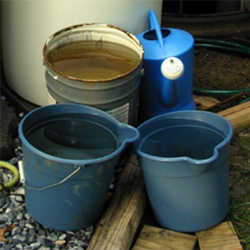 It has been used as a biofertiliser & weed suppressant in aquatic agriculture for thousands of years. In China for example, it has been grown in rice paddies between seasons since ancient times. According to Wikipedia, rotting azolla "releases nitrogen to the rice paddies, providing up to nine tonnes of protein per hectare per year". It is still grown for similar purposes today in large parts of Asia & represents a great option for organic growers. 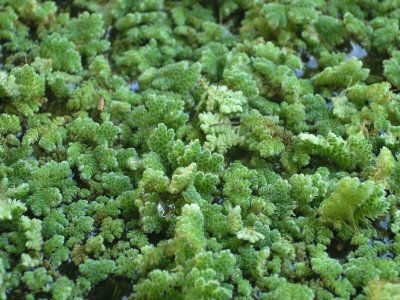 The name Mosquito Fern is gained from azolla's ability to prevent mosquitoes from breeding by carpeting water surfaces. This fact combined with its water cleaning & nitrogen-fixing characteristics make it good for covering water stored for gardening or agriculture; even if it isn't harvested for direct application as a green manure. Azolla can be a weed in waterways so it is important to know which is right for you. 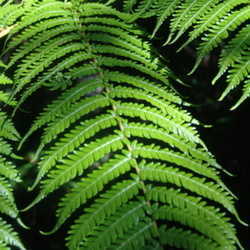 Endemic to North America, there is an equivalent to Red Azolla in the Carolina Mosquito Fern or Water Velvet, A. caroliniana. There is also Fairy Moss, A. filiculoides which is another, more tropical american native; plus Mexican Mosquito Fern, A. mexicana & the nameless A. microphylla. The asian variety is A. japonica & Africa is home to the final species, A. nilotica. Neither of these last two nor the australian species should be grown in the US, where they are considered weeds. In short, North America has far more variety when it comes to water ferns than any other continent. 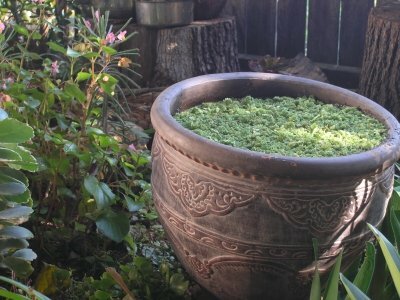 In the US, growers from gardeners to farmers have plenty of choice & plenty of reasons to try azolla. It can be an attractive ornamental, a natural water cleanser or a large-scale green manure; a genuine super plant.